Negative interest rates allowed real estate investors to book high valuation gains last year. By contrast, there are growing signs of marketing difficulties in the various real estate segments, as testified by rising vacancies, record-high supply rates, and higher time on market figures. The supply of rental apartments and commercial property is likely to outstrip demand in 2016. Low interest rates are proving a key contributory factor, with plenty of capital flowing into real estate development due to the comparatively high yields. The resulting expansion of property space increasingly looks out of step with the corresponding demand. Although the demand for rental apartments in 2016 is likely to match that of last year thanks to additional demand from refugees, yield prospects are looking less rosy following a decline in the influx of working immigrants. The economists of Credit Suisse are also forecasting weaker demand in the markets for commercial property, which is being driven not least by deep-rooted changes in connection with the digital revolution. Only in the owner-occupied housing market do demand and supply appear to be largely in a state of equilibrium. Rising interest rates or demographic effects in a few years' time appear to be the sole factors that could subject markets to a "stress test." For more than ten years now, the Swiss real estate markets have enjoyed near-paradise conditions: continuously rising prices and rents, booming demand, and low vacancies against the backdrop of low interest rates. In recent years, however, there have been growing signs that other, less favorable times lie ahead. Real estate investors are no longer able to source easy returns just like that. Further support from interest rates hardly appears possible. In the future, therefore, investors will increasingly have to rely on their own services in order to generate the hoped-for returns in real estate markets. 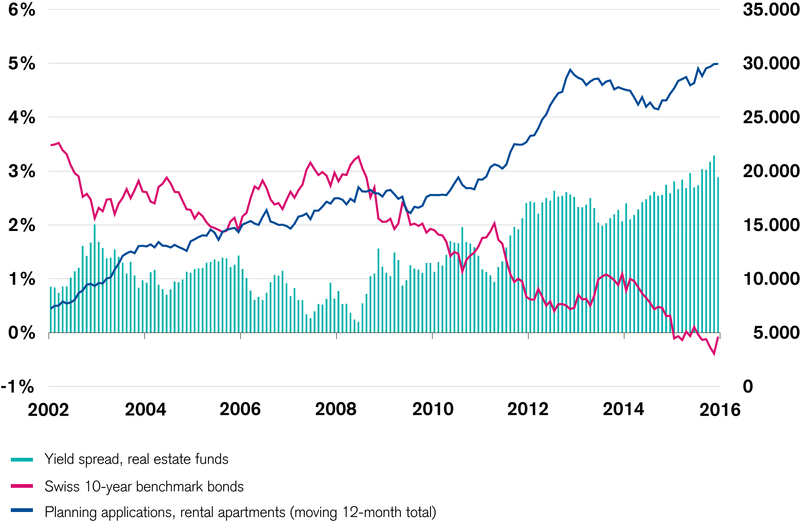 Negative interest rates provided another powerful, and possibly final, boost for valuations of real estate in 2015. Due to low interest rates, discount rates fell by a further 20-30 basis points, which resulted in strong revaluation gains for investors. But the brighter the picture in the rear-view mirror, the more challenging the road ahead for the real estate market. The handsome gains in the real estate investment market stand in stark contrast to signs of growing imbalances in user markets. In the rental apartment market, for example, vacancies have been rising by more than 4,000 apartments a year since 2014, despite robust demand. Marketing is becoming increasingly challenging, as is reflected in the increase in time on market figures of the average rental apartment, namely by four days to 28 days. Despite this development, the attractiveness of real estate returns as compared to returns on alternative forms of investment is triggering strong investment activity. Accordingly, the expansion of available floor space continues to increase unchecked. The economists of Credit Suisse are forecasting a further increase in supply this year of some 24,000 rental apartments. Given the unbroken momentum of construction planning applications, it appears unlikely that this surge of construction activity will abate any time soon. In 2016, the significant planned expansion of rental apartments should once again increase the number of vacant apartments by more than 4,000. As a result, the upward pressure on rental prices in Switzerland can be expected to virtually evaporate in 2016. The key driver of the anticipated end to rental price growth is the decline in the rate of immigration of workers on the demand side. The number of workers moving to Switzerland declined by some 10% in 2015, and the economists of Credit Suisse are anticipating an even greater decline in this influx of working adults in 2016, as employment growth is expected to slump this year. Viewed in terms of numbers alone, however, the decline in working immigrants is likely to be more than offset by the influx of refugees. The latter appear in the official data for Switzerland's permanent residential population either only partially (recognized refugees only in the data of the State Secretariat for Migration) or following a time lag of a year (as per the data of the Swiss Federal Statistical Office). The increase in the influx of refugees by 17,000 in 2015 according to the State Secretariat for Migration and the equally large influx expected in 2016 will therefore only be picked up hazily or following a certain delay. The additional demand for rental accommodation from refugees will primarily put pressure on demand in the lowest price segment, which is already fierce. The economists of Credit Suisse are expecting zero growth in office employment in 2016, and therefore extremely weak demand for office property. While key players such as financial service providers are struggling with structural change in their industries, the entire services sector is exposed to new challenges as a result of the digital revolution. The outsourcing of administrative support functions to low-wage countries (offshoring) is much simpler nowadays thanks to digitalization. Large companies have already outsourced tens of thousands of jobs, and as a result of the strong franc, offshoring is increasingly being pursued by small and medium-sized businesses too, which in turn is reducing demand for office space in Switzerland. This demand is already under pressure from the trend toward greater flexibility in the workplace (desk-sharing, home office, third places). However, digitalization also offers potential for new office workplaces, and is changing the nature of demand requirements. Against a challenging background of negative interest rates, investors are therefore planning to expand office space capacity. They are increasingly shifting their investments to medium-sized urban centers (e.g. Zug, Aarau, St. Gallen, and Lugano), where supply levels remain lower. After a stabilization in oversupply last year, a planned expansion of supply that exceeds historical averages will unquestionably intensify imbalances in the office market once again in 2016. No reversal should therefore be expected in the trends of increasing vacancies and declining rents over the next few quarters. The retail property market continues to be heavily exposed to the trend of digitalization, with online traders increasing their market share. The upheaval in this market segment appears to have only just begun, as compared to other countries online trading in Switzerland is still at an early stage of development, with a market share of just under 6%. A gradual rise to a market share level of 10%, as is standard in countries with a similar internet infrastructure, is likely to put retail space productivity under even greater pressure in the area of brick-and-mortar retailing, thereby reducing floorspace demand accordingly. Even as things stand, rising vacancies, a record-high level of space supply, and declining rental rates indicate that tenant activity is very subdued. The extent of the uncertainty over the future role of brick-and-mortar retailing in an increasingly digital world is clearly apparent in the planning of new retail properties, which is at an extraordinarily low level, despite the favorable interest environment. One of the few bright spots in this segment is the demand stimulus coming from food/near-food retailers against a backdrop of robust population growth. This aside, demand is focusing on the best sites available in busy shopping streets and well-managed shopping malls. These are the areas in which brick-and-mortar retailing appears to be holding up best against online competition. These locations aside, however, the marketing of spaces in this segment is proving a struggle. The economists of Credit Suisse are therefore expecting no change over the next few years in the trend of ongoing shop closures, rising vacancies, and declining rents. According to the economists of Credit Suisse, low interest rates and a moderate increase in real incomes represent an essentially positive background situation for demand for owner-occupied housing. The desire of many recently arrived immigrants to purchase real estate is an additional supporting factor on the demand side. By contrast, the (self-)regulatory measures in the area of mortgage lending and the associated increase in financial requirements for the acquisition of residential property are having a significant dampening effect. Credit Suisse economists are expecting the owner-occupied housing market to continue to lose momentum in 2016. Across Switzerland as a whole, this is likely to result in positive but weak price growth of less than 1%. The price correction in French-speaking Switzerland will continue, but without intensifying further in the view of the economists, as the parameters for owner-occupied housing remain attractive. However, as a structural analysis shows, the demand side will increasingly be propped up by individuals of a relatively advanced age. Today, the average Swiss homeowner is 57 years old. As the financially well-placed baby boomer generation gets older and lives longer, it will increasingly be older households that dominate the residential ownership market. By contrast, young households will remain longer in rented accommodation, as they are confronted also by high ownership costs and more rigorous regulation. Accordingly, there will be a growing gap between the generations. As a consequence, the owner-occupied housing market will be subject to a stress test – at the latest when the less populous demographic segments succeed the baby boomers. From 2018 onward, the economists of Credit Suisse are expecting a demographically-driven weakening in demand, which after a few years could be up to a third lower than it is today. This document was produced by Credit Suisse, and the opinions expressed in it are those of Credit Suisse as of the date of writing and are subject to change. It has been prepared solely for information purposes and for the use of the recipient. It does not constitute an offer or an invitation by or on behalf of Credit Suisse to any person to buy or sell any security. Any reference to past performance is not necessarily a guide to the future. The information and analysis contained in this publication have been compiled from sources believed to be reliable, but Credit Suisse does not make any representation as to their accuracy or completeness and does not accept liability for any loss arising from the use hereof.